GBA Alien Hominid (Europe) in 15:12.85 by FatRatKnight. Alien Hominid is a 2D side-scrolling shooter with heavy references to the Metal Slug series of games - from the hand-drawn graphics, huge explosions, right down to the ability to eviscerate FBI Agents when you get up close to them. The graphics are by featured artist Dan Paladin. Your goal, is quite simply, to get to the end of the stage, and die as little as possible. Which is made difficult due to the fact that any bullet is an instant kill. 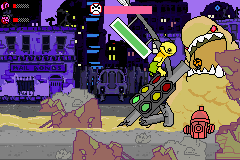 You control some sort of yellow alien with a gun. For whatever reason, he also has very Earth-like grenades with Earth-like explosions. He collides with some sort of satellite around Earth and crash-lands right in front of the FBI, who then runs off with his spacecraft and somehow forgets that bright yellow alien thing in clear sight. If you're looking for story, this isn't the game, as it just gives an excuse why you're doing these things. This TAS improves the one provided by the winner team at Dream Team Contest 3 by 41.03 seconds. This movie has a lua script that contains the Author's chatty commentary, and the encode of it can be seen on YouTube here.